What are your thoughts on eating in bed? I mentioned that Penelope and I were solo on Friday evening and for me, that means I get to do and watch whatever I want once she goes to sleep. And so I did what anyone in my position would do. 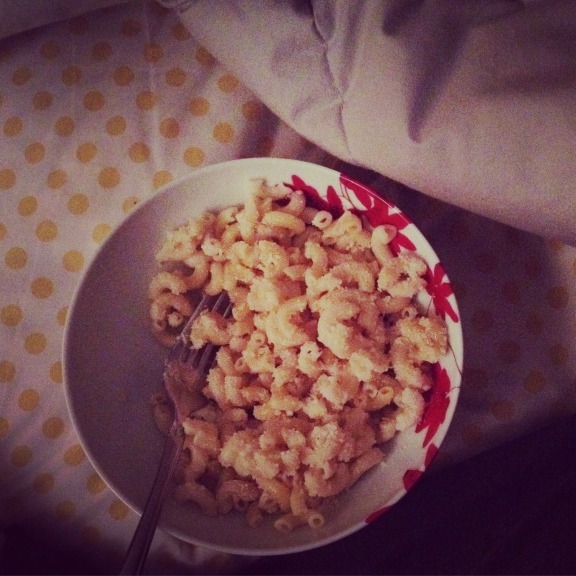 I indulged in one of my all-time favorite guilty pleasures: eating in bed. I put on my pajamas, cooked up one of my favorite comfort meals, climbed into bed, and ate my dinner while sitting pretty watching Outlander. When Shaun is home, I'd never get away with this. He hates when I eat food in bed and in all the years we've been together, I've never seen him eat food while in bed. Occasionally if he falls asleep on the couch, I'll creep into bed with my dessert and catch up on a show he would have no interest in, but this is a rare occasion. And so what I want to know is: what are your thoughts on eating in bed? Am I the only crazy one? It is such a glorious indulgence! PS: We also had a pretty great weigh in on instagram on Friday night.